Review of Martin Röw, Militärseelsorge unter dem Hakenkreuz: die katholische Feldpastoral, 1939-1945 (Paderborn: Verlag Ferdinand Schöningh, 2014). 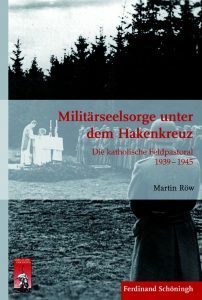 Martin Röw’s Militärseelsorge unter dem Hakenkreuz is among the newest contributions in a sudden flurry of work on chaplaincy and pastoral care during the Nazi period. Published in 2014, Röw’s text is the first rigorous, intensive analysis of the Catholic military chaplaincy during the Third Reich. At more than 450 pages, it is also the most detailed, even exhaustive. As such, Röw has provided the definitive book on this subject that is essential reading for anyone with an interest in religion in the military, pastoral care, and the world of German Catholic chaplains during the Second World War. Röw’s intentions are to deliver a comprehensive structural and experiential history of Catholic military pastoral care in Germany, with a particular emphasis on providing a systematic study of chaplaincy (12). He has oriented himself solidly in the available historiography on the subject in both German and English and his archival research is impressively broad, gathering material from four archdiocesan archives (including Salzburg), eight diocesan archives (including one in Austria and one in the Netherlands), and several other state and private collections in Germany. His main source for primary documentation is the Archive of the Catholic Military Bishop, in Berlin, notably the Georg Werthmann collection. Until relatively recently, this rich compilation of chaplaincy-related material, produced by the man who served as second-in-command of the Catholic chaplaincy during the Second World War, was strikingly understudied; in the past four years, three books have appeared whose authors have extensively mined its records. Röw articulates a concern with several facets of the chaplaincy’s existence, including the chaplains’ relations to military authorities, their understanding of the regime’s politics and ideology, the daily life of chaplains and their interactions with civilian populations, and their witness to war crimes. He is especially attuned to the challenges of accessing and interpreting mentality, and is determined “to drill into the mental dispositions” of chaplains wherever possible in order “to illuminate [their] self-conception and their mindset” (13). To some extent, he acknowledges the bias in and limitations of his main source, as Werthmann was the “nerve centre” of the chaplaincy (39), and his numerous judgments should not automatically be taken as balanced or neutral. Beyond the introduction, Röw dedicates a short chapter to constructing the Catholic milieu of Germany. In passing, he recognizes the minority position that German Catholics held in a newly united German empire after 1871, but he focuses more on the impact of the First World War and the Weimar era on German Catholics, the ascent of Nazism and the relationship between the regime and the Church, and the meaning of the war’s outbreak for the German Catholic community in 1939. Much of this work is summation of earlier, mostly German historiography; because this is the backdrop to Röw’s main focus, he introduces nothing revelatory or original about the larger context of German Catholicism. The bulk of his work, nearly four hundred pages, is devoted to the Catholic chaplaincy during the war. Röw divides his analysis of the chaplaincy into six main sections, the first two of which sketch the contours of the chaplaincy and the roles that chaplains expected themselves to fill as well as those that military officers asked them to take on. The first section considers the structures and individuals of the chaplaincy under Nazism, including general and specific chaplaincy statistics. There were “about 760” priests who served as chaplains over the course of the war, with 410 serving simultaneously at its peak, in the summer of 1942 (84). In a different section, Röw delves briefly into a quantitative social analysis of chaplains, offering statistics about regional background and generational variation; the leadership of the chaplaincy; the recruitment process and training; and the Nazi regime’s persistent, often explicit hostility towards the chaplaincy, culminating in the infamous 1942 order not to fill any vacant chaplain positions (120). The second section focuses on the context of the chaplaincy within the Wehrmacht, proclaimed at the time as “the pillar of the regime” (127). Röw depicts the military’s conceptions of pastoral care; the different kinds of relationships between chaplains and their officers, both positive and negative; the introduction of the much-detested National Socialist Leadership Officers (NSFOs) at the end of 1943; and Catholic chaplains’ interactions with their Protestant counterparts, both cooperative and competitive. The final four sections are dedicated to the war’s impact on the chaplains and contain some of the richest material from the Werthmann collection to be introduced in one book. The third section confronts the duties of a chaplain, highlighting the divine service as “the centerpiece of pastoral care” at all times (173); Catholic chaplains’ reactions to the mandated, and controversial, nondenominational services (interkonfessionelle Gottesdienste); the significance of chaplains’ presence at the frontlines; equipment and available literature; care for the wounded, the fallen, and the imprisoned; and “deviant chaplains,” those who Werthmann labelled “weak brothers” (232). The fourth section is Röw’s most sustained drive into the issue of mentality, considering how chaplains crafted meaning out of the war for themselves and the soldiers with whom they served, including nationalist and anti-Bolshevik impulses; displays of ambivalence, distance, and powerlessness, as well as affinity with the regime’s wartime goals; and the significant influence of a highly-developed sense of duty. The fifth section, on communication and interactions between chaplains and their various environments, includes Röw’s scrutiny of the impact of the chaplains (and religion) on the fighting troops; their roles as guides, mentors, and helpers for soldiers in the thick of battle; the community of chaplains, however nebulous, that existed throughout the war; and their relationships with other identifiable groups, including seminarians and priests serving in the Wehrmacht (the so-called Priestersoldaten), foreign chaplains and priests, and indigenous populations. The sixth section sees Röw endeavour to capture the kind of “everyday life in war” (“ein Alltag im Krieg”) that chaplains attempted to make for themselves, while admitting the challenges and controversy in introducing that word into the context of a war of annihilation (380-381). Thus Röw examines the typical official activities of a chaplain within his regiment or division; the peaks and ebbs of war as determined by active battle and proximity to the front; the experiences on different fronts, with a lengthy excursion into life on the Eastern Front; and their witnessing of atrocity (Röw uses the term Verbrechen for this section). This includes chaplains’ reactions to the maltreatment and murder both of Soviet POWs as well as of Jews. The almost-scant attention paid to this topic—fifteen pages—as well as Röw’s dependence on secondary sources and postwar published memoirs to flesh out the half-dozen or so eyewitness accounts that he has uncovered underscore the paucity of recorded testimony from the chaplains themselves. While many undoubtedly witnessed something, chaplains simply did not write about such things. For scholars who have studied the Catholic chaplaincy in the Wehrmacht, Röw’s analysis does not necessarily bring anything ground-breaking to the subject of chaplains and pastoral care during the Second World War, or the hostility of the Nazi regime towards the Catholic Church in general and priests in the Wehrmacht in particular, or to the nature of the war and how devout Catholic clergy tried to makes sense of it. The identification of Bolshevism as an enemy provided a convenient overlap between Catholic and Nazi ideologies (260-270). Chaplains were dependent on good relations with the military authorities to be able to work effectively. Röw argues that “outspoken opponents of pastoral care, such as Nazi supporter General Schörner, commander of the 6th Mountain Troop Division, appear to be an exception” (145). Written or explicit criticisms of the regime or the Führer were—not surprisingly—non-existent, given the lethal reaction they would have provoked (291, 298). The significance of Röw’s work is not its originality; it is that his study is the first methodical, systematic treatment of the chaplaincy, from the top of its hierarchy—the relatively feeble field bishop, Rarkowski, isolated from the other bishops and supported by the Nazis, alongside his field vicar-general Werthmann, judicious, active, energetic, willing to take risks (103)—to the chaplains standing next to soldiers on the field of battle. For this reason alone, the text is indispensable. Röw’s objective is to produce a study of Catholic pastoral care during the war “in its various spheres and facets, but always viewing pastoral care as a whole” (442), and in this he has succeeded, though he has had to sacrifice depth in order to achieve breadth. The character of individual chaplains is underemphasized in favour of the institution in which they served, so that one is hard-pressed to keep track of the names (which are not always given in the footnotes). Despite the brief foray into the social and regional background of some chaplains, there is only a passing understanding of how old, or conversely how young, the chaplains tended to be, how long they had been priests when they were recruited, how their familial and regional histories moulded their pastoral behaviour in the military, or how many came from Austria or other annexed territories of the Reich. (Curiously, one of the most striking omissions in Röw’s list of archival resources is the archdiocesan archive of Munich and Freising, one of the largest archives of its kind in Germany). Werthmann is very present throughout, but remains as slippery and enigmatic as ever. Röw admits, “Whether [Werthmann’s] motto actually was, ‘good German and above all Catholic, but not and in no way National Socialist,’ as Heinrich Missalla alleges, cannot be said with certainty.” (103) Although the collection that bears his name is at last receiving the scholarly attention it has long deserved, we still await a definitive biography of its creator. One might have wished for a clearer sense, too, of change over time within the wartime chaplaincy, particularly given the turning-point of 1942, when no new chaplains were recruited. Röw is undoubtedly correct when he claims that his work challenges the older interpretation of chaplains as unpolitical, and their military service as merely “care (Fürsorge) for men mired in the misery of war” (445). It is difficult to disagree with his conclusions about the motivation of so many chaplains, composed of an amalgam of “Catholic idealism, fueled by a specifically Catholic inferiority complex with deep historical roots, and a patriotism that convinced them that they were in no way second to non-Catholic Germans” (446). Röw is unflinching in his final assessment of the effect that chaplains had on the kind of war fought on the Eastern Front, articulating what those of us long familiar with these sources have known: their very presence encouraged soldiers to justify their behaviour as legitimate, even necessary, in an existential battle against an enemy—Bolshevism—that sought to annihilate German and Catholic culture. In this manner, priests in chaplain uniform “became, however involuntary, instruments of normalization of the war of annihilation” (448). And Röw has sifted his sources thoroughly to provide demonstrable proof of this. Although the regime worked doggedly to nullify the influence that a relatively small number of chaplains (760, says Röw, in an army in which some 18 million men served) had on the troops, the chaplains ultimately rendered a vital service in sustaining the Wehrmacht’s fighting fervor, especially on the Eastern Front. Yet the number here might give one pause: how could so few chaplains possibly have motivated millions of men over a span of several years? They could not possibly be everywhere at once, and Werthmann, Röw’s primary resource, acknowledges that some divisions went months, or more, without access to a chaplain. Does this not suggest that the chaplains inflated their own importance, precisely to justify their presence at the front, both at the time and after 1945? Undoubtedly the Priestersoldaten—more than 17,000 Catholic priests, members of religious orders (Ordensleute), and seminarians who were conscripted but did not serve in the chaplaincy—helped to fill in some gaps, though these individuals fell outside the chaplaincy and Röw accords them only a few pages. What will really answer this question is testimony from the soldiers themselves about the impact of religion and the men who represented it: chaplains, as well as priests and other religious outside the chaplaincy wearing military uniforms. This is, admittedly, beyond Röw’s focus. His milieu is the chaplaincy, and while he begins to address the issue of reception, he does so in somewhat cursory fashion, referring to what responses to pastoral care military authorities told chaplains to expect from soldiers (326-329), and then to the perspectives of chaplains themselves (329-336). Röw does not claim to have answered all outstanding questions about the Catholic chaplaincy with this work. Indeed, he lists several areas for further research in the final pages, including theological themes in wartime sermons and other writing, comparative studies of chaplaincies in different militaries during the war, and the much-desired critical evaluation of Werthmann. But it might be time to shift focus in order to address more fully the questions that this research engenders. Perhaps we should begin to look less narrowly at the men who brought religious care to the troops, and instead scrutinize more attentively what the troops themselves did with that religious care. Röw has provided an exceptional overview of the former in the German context, and it should be considered essential reading for any scholar asking questions about religious care in the German military during the Second World War. Chronologically, Röw’s book was the first published, predating my own work by only several months. Röw was aware of my doctoral dissertation and cites this briefly in his introduction, though I was not aware of his work until it was published. While we both worked in the same archive in Berlin at roughly the same time, we never met each other. He did not have access to my book on the subject, Wehrmacht Priests (2015), prior to publishing his work. The third book is Dagmar Pöpping’s Kriegspfarrer an der Ostfront, a comparative study of the Protestant and Catholic chaplaincies, which appeared in 2017. This dearth was made even worse by the 1942 prohibition to fill vacant chaplain positions, as Röw details. See 120-122.